The Trump Administration is repealing the Clean Power Plan. They have approved the Keystone XL pipeline. They shut down the EPA’s Climate Change website in April, and when it returned in July, it was half-missing. Trump cancelled Obama’s Climate Action Plan. He dropped climate change from the list of national security threats in the U.S. National Security Strategy. He revoked FEMA sea level rise flood risk standards. He abandoned the most important climate treaty in the world, the Paris Agreement. They reversed Obama’s ban on offshore oil exploration in the Gulf of Mexico, Atlantic, Pacific and the Arctic. They are stonewalling on rules for the first vehicle fuel economy standards implemented in 40 years by President Obama. They disbanded the federal advisory panel for the National Climate Assessment. They are rescinding the freeze on new coal leases on public lands reneging on methane reporting requirement. The Trump administration is scrapping an anti-dumping rule for coal companies. They have reversed their decision on the Dakota Access pipeline. They are killing the Northern Bering Sea climate resilience plan. He is rescinding royalty regulations for oil, gas and coal. He is removing environmental review requirements to consider greenhouse gases. They have reversed the National Parks Climate Order. They are doing away with EPA’s calculations for the “social cost” of carbon. They are gutting fracking regulations on public lands. They are gutting regulations on oil and gas drilling in some national parks. And they are gutting oil rig safety regulations. They are rescinding regulations for offshore oil and gas exploration by floating vessels. They are rescinding the ban on drilling in the Arctic Wildlife Refuge. And they are not taking action on new methane emission limits at new oil and gas wells. Trump has repealed the SEC anti-bribery rule for oil and gas companies. He has rescinded executive orders on climate resilience. 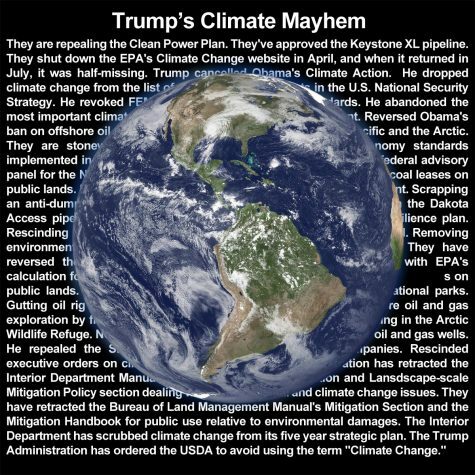 The Trump administration has retracted the Interior Department Manual, Climate Change Policy Section and Landscape-scale Mitigation Policy section dealing with environmental and climate change issues. They have retracted the Bureau of Land Management Manual’s Mitigation Section and the Mitigation Handbook for public use relative to environmental damages including climate change impacts. The Interior Department has scrubbed climate change from its five year strategic plan. And Trump’s EPA director Scott Pruitt sued the EPA four times to block the Clean Power Plan when he was the Oklahoma Attorney General, and once against methane emissions rules. And, Trump appointed Secretary of State Rex Tillerson was ExxonMobil CEO from 2006 until his appointment as Secretary of State.